To book services or activate your account please visit our customized Time to Pet Portal. Basic Obedience Cues as well as some more advanced/useful cues to include: Focus, Sit, Down, Stay, Intro to Heel, Loose-leash Walking, Walking & Greeting Politely On-Leash, Targeting, Drop It, Leave It, Come When Called. Hand-outs will be provided as we cover material for study at home. Focus on Proper Socialization, Play, and Doggie Body Language. Specific Problem Behaviors & Management Methods—using your cues to manage every day real life situations in your dog’s environment. Please note that Wednesday & Thursday Beginner Band Practice courses may be blended with adult dogs in need of the basics at BnR’s discretion. Monday courses are strictly for puppies 1 year and under. Group will meet for a total of 6 sessions. First lesson attendance is MANDATORY and is for HUMAN STUDENTS ONLY. Doggie students will attend classes 2-6. Our first class will cover what to bring in addition to your furry friend to the following sessions. A notebook and pen or pencil would be handy for the first meeting. Bring your questions as well and we will cover appropriate topics during any remaining class time. Our training methods are POSITIVE and family-friendly. We use reward-based training (treats or anything appropriate that your dog finds rewarding enough to motivate him to learn new behaviors. We will teach the steps to move on to a random reward schedule as well once new cues are reliable.). You will learn the basics of clicker theory as well as alternative methods to train if the clicker isn’t for you (though we believe that the Clicker is Quicker!). All dogs must be on a 4 to 6 foot non-retractable leash for class. We DO NOT use pinch, choke or prong collars in class so please make sure your dog is wearing the proper collar or harness. You will also need to bring a small blanket, towel, mat or bed to class for your pup for training exercises. If you need assistance choosing equipment please feel free to contact us. A spot in class will be saved for you only after you have completed payment. If you prefer to pay by check please contact us before mailing out to us so that we know to expect it and hold a spot for you. A spot in not guaranteed until you receive confirmation from us that one is available. You will receive a welcome/prep email a few days before your course is scheduled to begin. Please email us directly if you do not receive this within 24 hours of the start of class. MEETS ONE SUNDAY PER MONTH! Come Rock Out with your pups under the supervision of our team trainers! When: One Sunday per month from 10am – 11am the teeniest meet (8 weeks to 6 months). From 11am – 12pm the Rising Rock Stars 6 months of age to 1 year meet to play! Who: Puppies that have been vaccinated current to their age, ages 8 weeks up to 1 year old. Puppies should wear a flat (non-choke) collar, no harnesses please. Owners must provide proof of current vaccinations to participate. What: An opportunity for your puppy to socialize off-leash with other puppies similar in size and play style. The group class will help puppy parents learn about managing puppy play, positive puppy handling techniques and to read canine body language. Team Bark n’ Roll Trainer(s) will organize and oversee the group. Why: Puppies will naturally behave in a way that may be considered inappropriate to humans but completely normal to other puppies. When paired with other puppies, your pup will learn natural manners from his peers and gain experience with canine body language. What if I already have a dog or a few dogs that my puppy socializes with in our home or nearby? Your puppy has been socialized to only a small number of dogs in a world of many dogs. She will benefit from meeting and playing with a variety of new friends. All dogs must be on a 4 to 6 foot non-retractable leash for class. We DO NOT use pinch, choke or prong collars in class so please make sure your dog is wearing the proper collar or harness. If you need assistance choosing equipment please feel free to contact us. Basic Therapy Dog Work Training Practice. 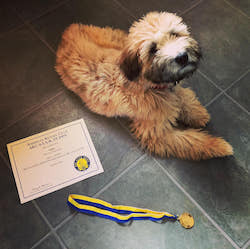 Refining Basic Obedience Cues to include working toward mastering the inclusion of the 3D’s: Distance, Duration & Distractions as well as a focus on practicing the requirements of the AKC Canine Good Citizen Requirements. CGC Evaluation will be administered to all students interested in participating at Class Session #6. Hand-outs will be provided as we cover material for study at home. Specific Problem Behaviors & Management Methods using your cues to manage every day real life situations in your dog’s environment. Group will meet for a total of 6 sessions. Doggie students will attend ALL classes. Please contact us to see if your dog would be appropriate for this specialized course. Class size is intimate for this course to provide maximum comfort and attention to our “socially challenged” students and their humans. Behavior Adjustment Training Techniques that teach your dog to cope with his or her environment through practice confronting his or her triggers in a controlled and rewarding way. Focus on properly reading Canine Body Language and proper leash management techniques. Specific Problem Behaviors & Management Methods—using your cues to manage challenging every day real life situations in your dog’s environment in order to make them less challenging over time. Group will meet for a total of 6 sessions. The first session is HUMANS ONLY. Dogs will be coming in pairs to sessions 2-5 and all dogs will attend session 6 if their humans and class instructors deem appropriate. UPCOMING DROP-IN PUNKY PUPS CLINIC: Sunday March 31, both meeting at 10am – 11am, Rita Mullin Field, North Reading. BnR will be holding a Kids n’ Canines seminar to discuss dog & child safety & management within the home and community. It will cover many topics ranging from preparing the family dog for a new human addition to the household, life with dogs and little ones in the home, as well as welcoming a dog into a home with little ones. This is not just open to expecting or new parents, but also to those with dogs that currently live with or may live with or interact with little ones ranging from newborn to 5-7 years old or so (ex. grandparents, aunts & uncles, family friends, caregivers, etc). It will be humans only and geared towards an adult audience. Being family-friendly trainers, we truly believe in the importance of the information that will be presented in this seminar and look forward to educating our local community on this vital topic and engaging in an active discussion with all present. We believe that proper preparation, professional guidance and management can prevent injury, family tension, as well as the re-homing or worse of the family dog due to miscommunication and lack of training and education. In our experience not enough attention is paid to this topic until it is unfortunately too late. We hope to encourage pro-activity over reactivity! Bark n’ Roll offers Basic & Advanced Obedience Training through Private In-home, In-studio or On Tour Field Trip Courses & Sessions. 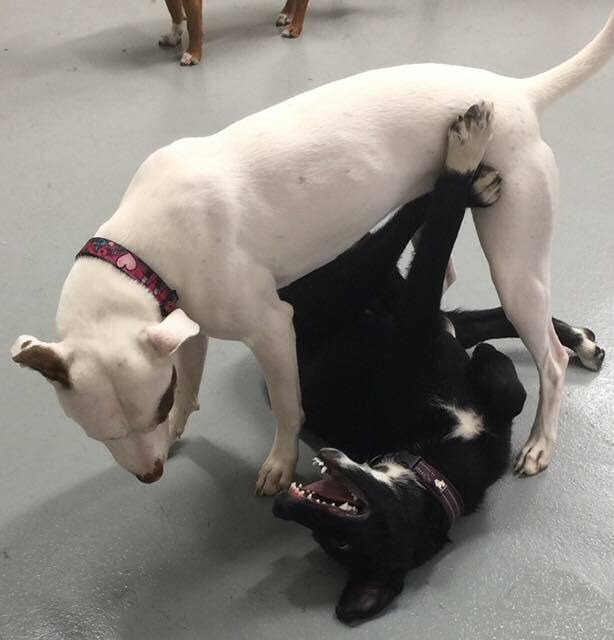 We will work out a realistic program that specializes in the needs of you, your dog and your home/environment that can include basic obedience cues, obedience refresher sessions, troubleshooting problem behaviors, helping you prepare for welcoming a new puppy into your home, potty/crate training basics, and more. We believe in the Power of PAWSITIVE Training and use only positive methods when working with dogs. Please contact us for more details and pricing for Private Training for some Solo time! You can also save a few buckaroos by setting up In-Studio Duet Sessions when you book Semi-Private In-Studio sessions with a friend or family member! Packages are non-refundable, to be paid in full at first private session and we have a 24 hour cancellation policy. Please contact us no later than 6:00 pm the day of the class if you plan to attend or can no longer attend the session. Basic & Advanced Obedience Cues at your dog’s level and pace: Focus, Sit, Down, Stay, Intro to Heel, Loose-leash Walking, Walking & Greeting Politely On-Leash, Targeting, Drop It, Leave It, Come When Called, Canine Good Citizen Prep. Hand-outs will be provided as we cover material for study at home. 20% OFF one Private In-Studio New Puppy/Dog Prep & Potty Training Session when you sign up for a 6 week S.T.A.R. Puppy or Beginner Band Practice course! Bark n’ Roll supports our troops and knows how important a well-behaved canine companion can be to our returning veterans. Please contact us about our Vets ROCK! discounted training program that we offer to the few and the proud in thanks for their service.